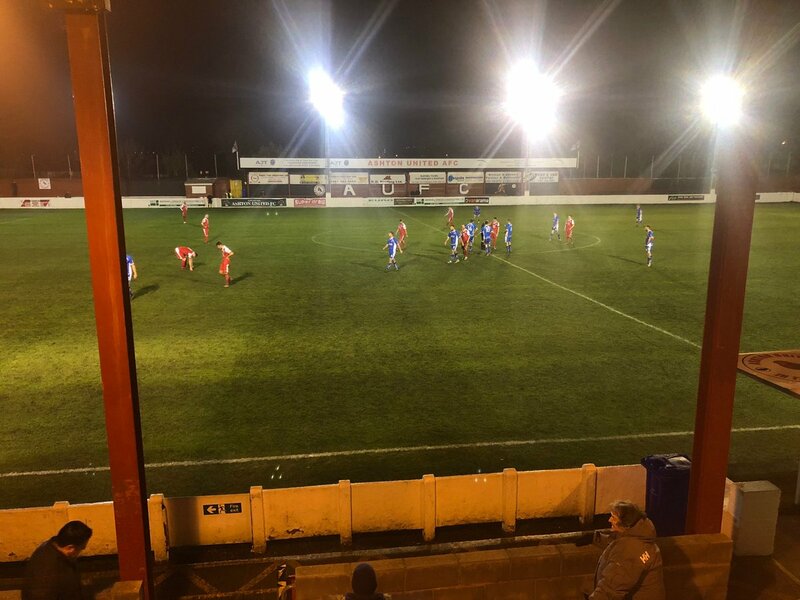 Alfreton Town returned to winning ways in the league and claimed a first league away win since September as two second half goals from Richard Peniket and Reece Styche sealed an important win at Ashton United on Tuesday night. Billy Heath made two changes with Styche and Callum Chettle coming back into the side, new addition Danny O'Brien was on the bench. The early stages of the game saw us try and take the front foot with Chettle finding space on the left but alert defending cleared the danger. Askew then delivered a great ball from the left but Sam Ramsbottom saw the ball out. The Reds were pressing well and looking to retain the ball back at every chance they lost it but were still looking for the elusive attacking move. Ashton pressed and Adam Curry was alert to clear a free kick before a shot went way over the bar from outside the box. Martin Riley intercepted well with a crucial tackle to prevent a one v one before Ramsbottom palmed away Jackson's low effort away for a corner. Styche was then played in on the left but his attempt to cut inside was blocked and cleared. The Robins were getting on the front foot mid-way through the first half as Askew went on a mazy run from the left and was only stopped when he got into the box by Tom Allan. We managed to weather the storm and started to respond, Josh Clackstone floated a free kick over towards Allan who headed on but Pilling raced out well to prevent Clifton getting a touch. Ashton should have taken the lead on 34 minutes but Jackson put Martin's cross from the left wide when unmarked in the box. Curry then tackled well to prevent Martin a gaolscoring chance before Styche fired wide of the post at the other end. Another huge chance came for the hosts just before the break as Martin fired over the bar after Ramsbottom parried a shot from outside the box. It was another left off for the Reds who had stayed in touch and Ashton went into the break disappointed that they didnt take at least one of those chances. The second half saw Alfreton switch into gear and change the momentum of the contest, Sam made an early save to deny Anghel at the near post, Chettle then fired wide of the post in the box. Half openings came for us as Allan's cross was cleared before Clifton's corner was cleared to Styche who fired over the bar. However with 61 minutes gone, Richard Peniket opened the scoring converting Allan's cross from the left with his head from a few yards out. It was a massive goal for us and the confidence began to flow through the Reds and the second half certainly showed what the side is capable of. Chettle nearly found Peniket with a cross before Regan headed straight at Ramsbottom from a free kick. On 74 minutes we doubled the lead as Styche's first effort was blocked before he lashed the second effort into the roof of the net. The Robins pressed late on as Regan headed over before we cleared several late crosses into the box. Alfreton saw the game out and earned a crucial and confidence lifting three points as well as a clean sheet on the road to at least get back on track in the National League North. Next up, Spennymoor Town visit the Impact Arena on Saturday with a 3pm kick off. ATFCXI: Ramsbottom, Clackstone, Allan, Lynch, Riley (c), Curry, Clifton (Hotte 84), Styche (Hobson 82), Peniket, Platt, Chettle. Subs Not Used: Nicholson, O'Brien, Bateson.